Jim Walkowski, right, talks about former Government Way housing resident Tony Watson, a U.S. Navy underwater diver who was on the 1985 hijacked TWA airplane of Flight 847, during the March 20 Government Way decommissioning ceremony. From left, Bainbridge Mayor Anne Blair, Kathryn Keve, Jon Quitslund, Greg Lotakis, Karen Vargas and Fred Scheffler listen to Walkowski. Tom Vargas said giving a proper closure to a subdivision that served as government housing was one of the best things about participating last Thursday in the decommissioning of a Bainbridge street formerly known as Government Way from 1957 to 2007. Tom, and his wife Karen, lived on the street for 10 years starting in 1992. Tom donated an American flag that was used on the USS Alabama submarine at Bangor. The flag was used during Thursday’s ceremony to conclude the event. Karen, along with Kathryn Keve and others, worked hard to collect the names of former residents, other stories and historical facts that were tied to the 16-house street. Karen retired from the Army. Tom served on the USS Alabama with frequent Government Way visitor Brian Moss, who died in the Sept. 11, 2001, terroristic attacks while working at the Pentagon. The two friends enjoyed barbecuing together. “Home is where our stories begin and this was a day of stories and it will continue to be,” Blair said. Ross Smaaladen, a construction worker with PHC, thought the ceremony was “awesome” and appreciated learning some of the interesting history of the homes and residents. PHC employees are dismantling the 16 rambler style homes on the street to make way for the new 5-acre second phase of the Grow Community. The new development literally will be situated on what is now John Adams Lane and will feature 3 acres of open space that will be mixed with fields, orchards and light forest groves. “We’re helping to build the next stage of history for the community and it’s great to be a part of it,” said Seppi Gorecki, another PHC construction worker. 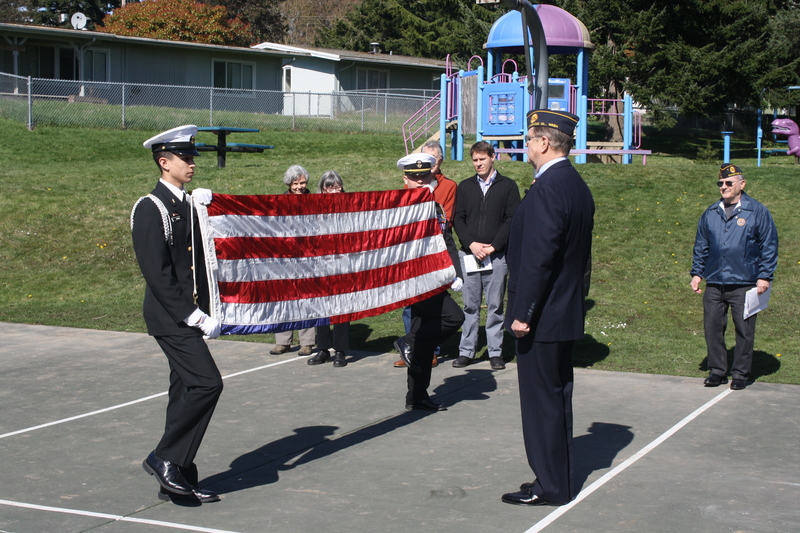 Six of Bremerton High School’s Navy Junior ROTC members also participated in the decommissioning and conducted the flag-folding ceremony. Michael Shiflet was the cadet that presented the flag to American Legion Post 172 Commander Fred Scheffler at the event’s conclusion. U.S. Army recruiter Sgt. Clarence Jennings drove from Silverdale to also attend the ceremony. 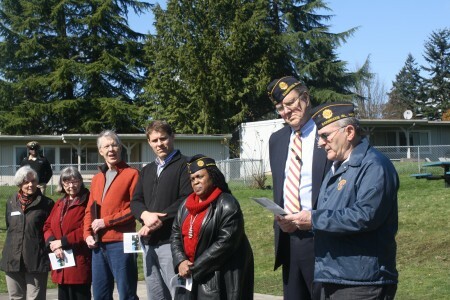 “I’m honored they asked us to do this and that’s what we do – leadership in the community,” said Sr. Chief Anthony Jones of Bremerton High’s Navy JROTC. Greg Lotakis, project manager for Asani Developments on the Grow Community project, said he was appreciative of everyone who made the street’s decommissioning event possible. Lotakis said trails and a community center will be included in the new Grow development, which will also acknowledge the history of street and its residents with signs. Members of Bremerton High School’s Navy JROTC unit present American Legion Post 172 Commander Fred Scheffler with an American flag that once was previously used on the USS Alabama submarine at Bangor to conclude the Government Way decommissioning ceremony. 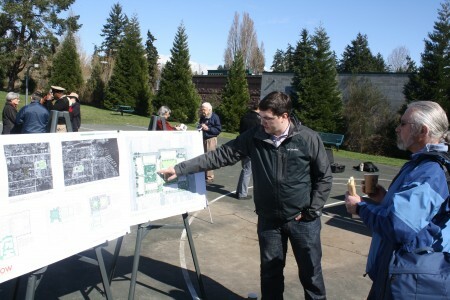 Brandon Keller of PHC Construction, right, goes over the designs for new 5-acre second phase of the Grow Community with real estate agent Keith Hauschulz after Thursday’s Government Way decommissioning ceremony.